Detroit's Eastern Market is gearing up for the Spring Season when all shed's open and market-goers from all over Michigan and northern Ohio flock to one of the gems of the midwest-Saturday at Eastern Market. But Eastern Market is open year round and Shed 5 is where it is happening-especially for families. 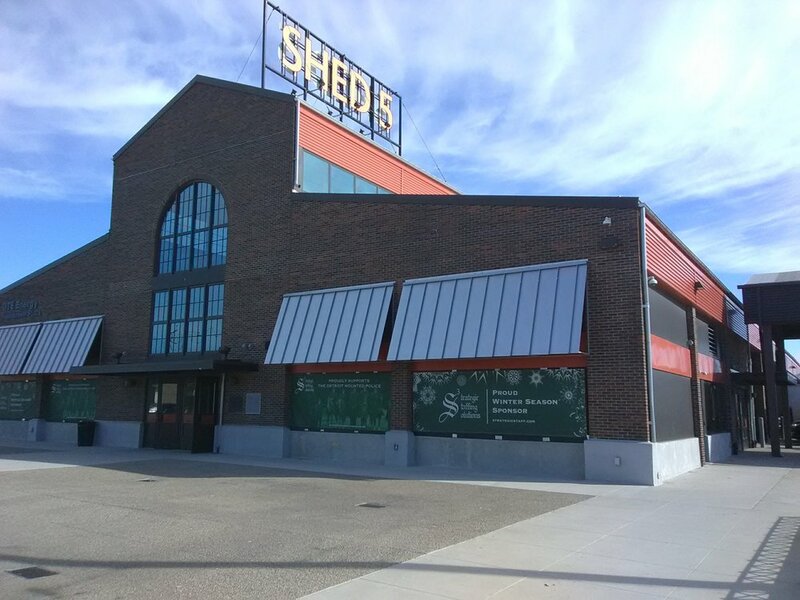 Shed 5 during the winter contains everything you love about the Eastern Market experience-the fresh fruit and vegetables, the small batch jams and scones, the locally roasted coffee, the candles, the t-shirts, the live music, the fun, lively atmosphere-but on a smaller scale. In some ways, for families, the Shed 5 experience on an early morning on a Saturday in March, might be the best introduction to the market. The parking is easier. I pulled right into a spot on the street just north of the shed off of Orleans and had an easy one block walk to the entrance. The crowds are smaller too. Sometimes, the sheer size of the summer Saturday experience can overwhelm younger children. One of the other benefits of the smaller crowds (at least in the early morning) is that you have more time to talk to the vendors without feeling rushed. It was great to spend a few minutes learning more about Jen's Dressing and the great work done by the Detroit Food Academy and their delicious Mitten Bites. The student I spoke to has already earned several scholarship through the Detroit Food Academies, excellent blend of small batch baking and entrepreneurship-congratulations! We always like to encourage our kids to ask questions to learn about the products or the owners. It is a great way to practice social skills and language skills-and it just makes it more fun! I was able to get over to the Dequindre Cut, just about two blocks from where I parked and was amazed by the Mirror Mosaic Building. It's worth a trip down just to see it. I can imagine it becoming a great photo op for the wedding party going for an urban feel or for the artistic senior pictures. Try to get over to Shed 5 early Saturday over the next few weeks and enjoy a wonderful family friendly experience in Detroit's Eastern Market. 1. What is the importance of Detroit's Eastern Market to metro-Detroit? 2. What are your favorite fruits and vegetables to get at Eastern Market? 3. Why is it important to eat healthy foods and how does Eastern Market promote that? 4. What are some of your favorite stalls at Eastern Market? 5. Take a look at the architecture and artwork nearby- what do you notice? Looking for a great musical soundtrack to listen to on your way down?